Life in Year 5 is an enjoyable mix of hard work, friendship and being a good disciple, in line with our Gospel Values. In addition to regular participation at Mass, together with other services at Church, children are given the opportunity to conduct and lead their own prayer services. The altar is a focal point of our classroom, dressed in accordance to the colours of the liturgical calendar. As well as daily work in Mathematics and Literacy, the children have a wide curriculum to stretch and challenge them. Homework is set on-line or there is a paper-based option. There is always great interest in our subjects and our creativity allows us to experience a broad, balanced curriculum. We plan and carry out our own experiments in Science. During our History lessons we study the Greeks and Victorians. The children enjoy topics like football, dance and cricket in PE and in Computing they create blogs and various spreadsheets. All Year 5 pupils have the opportunity to learn the clarinet within their music lessons. 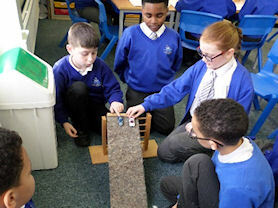 Year 5 work very closely with Year 6, to ensure a smooth transition so that the children reach their full potential in the final year of our school. Learning about friction in Science competition. 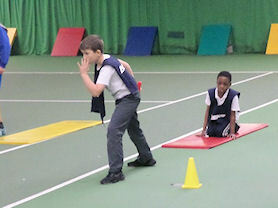 Year 5 taking part at and indoor athletics. 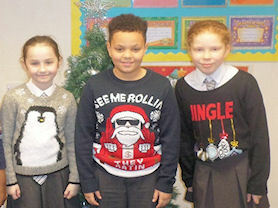 We love Christmas Jumper Day at St Jude’s. We are well supported by our parish priests.